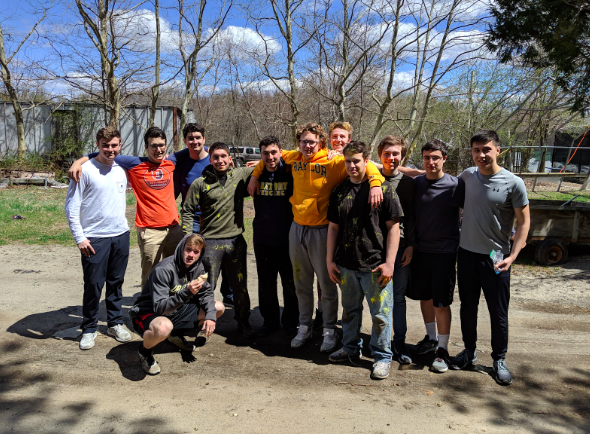 This year, the Seniors went on a trip to Top Gun paintball in Jackson, New Jersey. The day started out very early, with the seniors lining up to collect their paintball guns, masks, and ammunition for the day ahead, which would be packed full of paintball battles in a handful of different locations around the Top Gun campus. Two captains were instantly picked, Mr. Marsh and Mr. Gaertner, and they drafted teams to prepare for the first war, which was in a forest area with two main bunkers and trenches. The first few battles in the forest area were pretty quick, with the game type being “one shot, and you’re out”. The highlight of this first battle was Mr. Marsh dashing into battle rambo-style, equipped with his own paintball assault rifle and countless extra rounds of paintballs to mow down the enemy team. Throughout the day, Mr. Marsh’s team had the competitive advantage because of his strategic drafting of players who had already played in the past such as Patrick Jackson and James Crapser (who also came dressed as military officers, showing that this wasn’t their first time on the paintball field). The final battle of the day took place on a course called “Lego”, which was a complete free-for-all, with the only way to get out of the game being running out of ammunition or surrendering from the pain of the paintballs. The game was even until the end, when one side reserved their ammo and unloaded all of their rounds into the remaining few players on the other side. Overall, the trip was very fun, allowing the Senior class to compete against each other one final time as a group in a sport that almost nobody had played before that day.